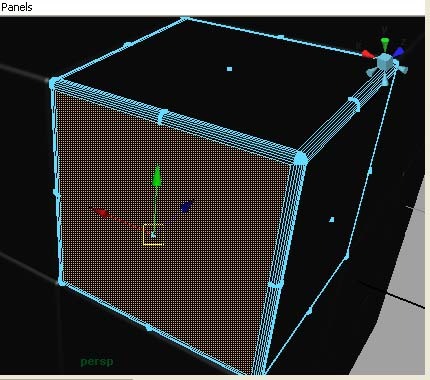 This tutorial was done in Maya 8.0, but should easily be do-able in Maya 6 and above. UPDATE: An Updated Rig is available over here. 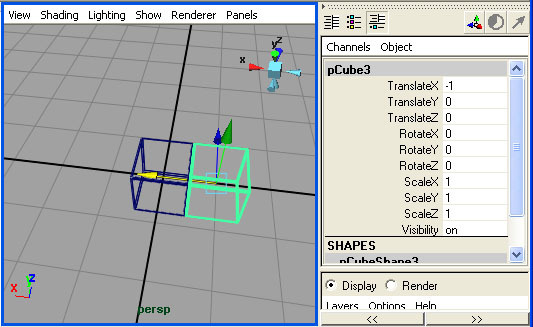 Create a polygon cube using Create -> Polygon Primitives -> Cube. 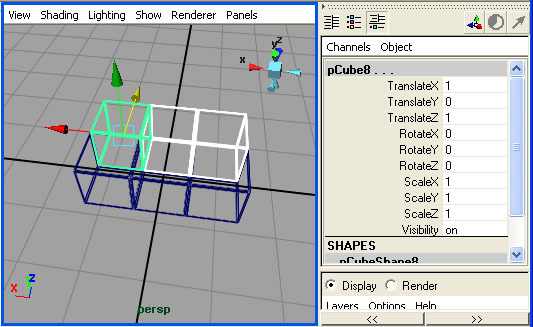 Make sure that the 'Polygons' menu set is active by selcting Polygons from the drop-down box in the upper left-hand corner of the Maya window. 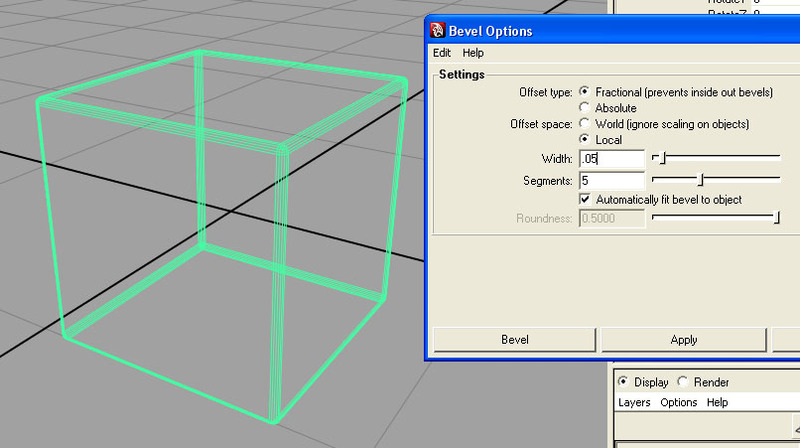 Open the options for the Bevel tool by selecting Edit Mesh -> Bevel ->  . Make sure to click on the little box next to the word Bevel, this will open up the options box. 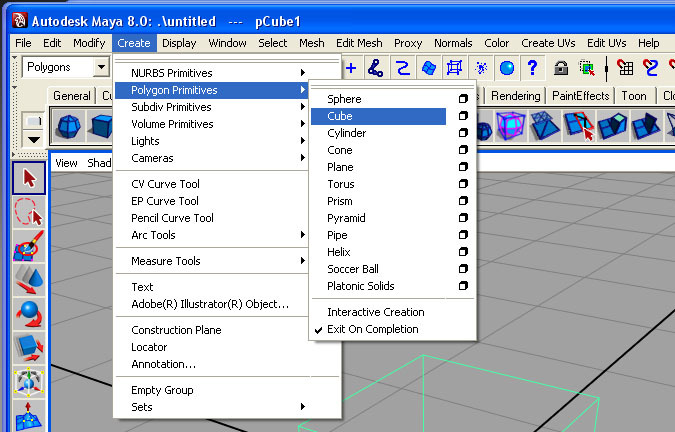 The Bevel tool is in a menu called "Edit Polygons" previous versions of Maya. Set Width to 0.05, and Segments to 5.0 . Click Bevel. This will be the base shape for each of the 26 boxes that make up the Rubik's Cube. 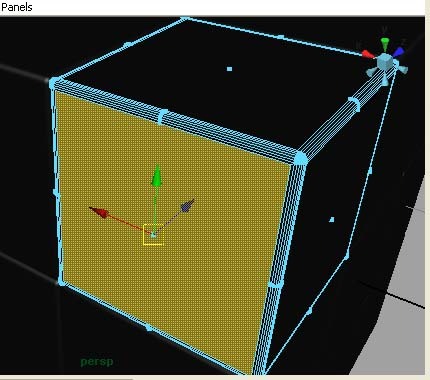 Switch to face selection mode by right-click-and-holding on the cube. Select "Face" from the menu that pops up. Select the middle face on each side of the cube. For this next section it is important that you have Construction History turned on. Make sure you see this icon in the top icon bar: and not this one: . To toggle between the modes, click the icon. Run Edit Mesh -> Extrude. 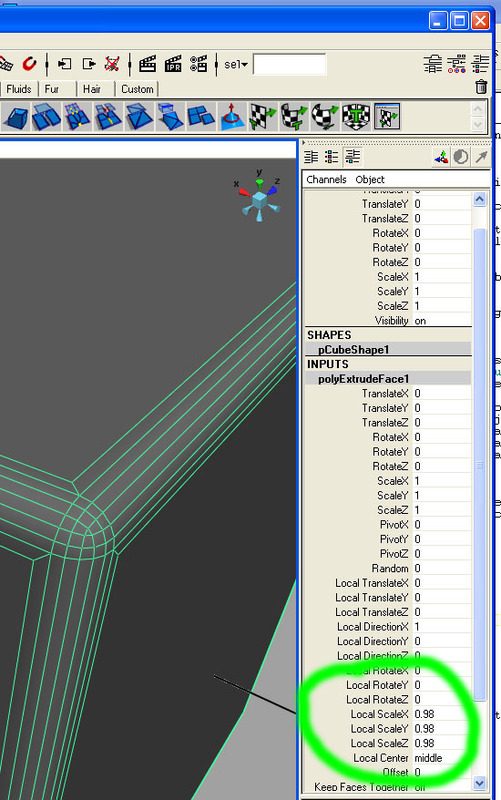 In previous versions of Maya, this was called Edit Polygons -> Extrude Face. 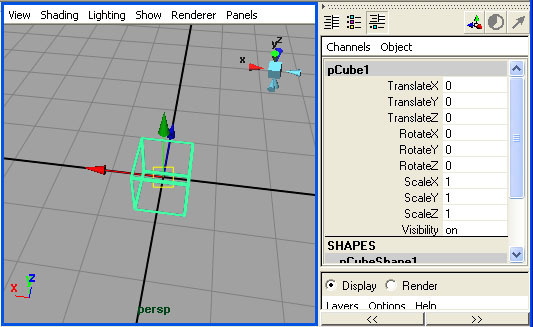 Press 'F8' to return to object selection mode (The object should be colored green again). 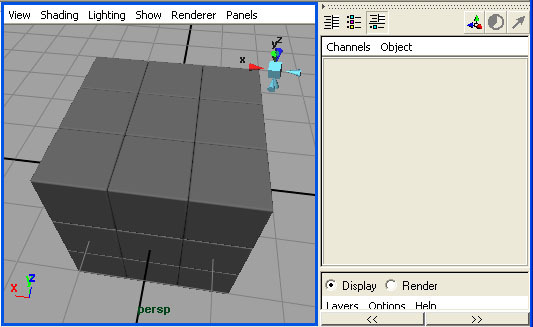 There will be an entry in the Channel Box (left side of the window -- see below) called polyExtrudeFace1. Click on this entry, and a list of values will appear. Change the 'Local Scale X,' 'Local Scale Y', and 'Local Scale Z' values to 0.98 . 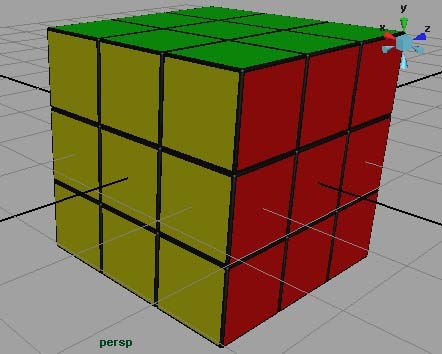 This next part is a bunch of duplicating this shape to make a total of 26 cubes that form the outside of the whole Rubik's Cube. 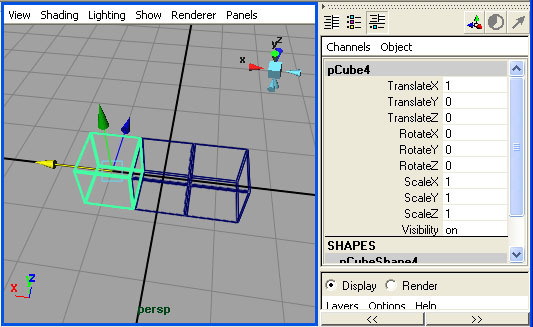 Each time you run Edit->Duplicate, type in new values into the Channel Box in the Translate X, Translate Y, and Translate Z boxes to move each new little cube to the right position. That's the whole shape! Now for adding colors. Open the Attribute Editor by clicking this button in the upper-right corner of the window. Make this a black shiny shader by clicking on the color, and choosing black. Assign this shader to the geometry by 1) selecting all of the cubes you have made, 2) right-clicking on the black shader in the Hypershade, and 3) selecting Assign Material to Selection in the pop-up menu. In the viewport menu group, select Shading -> Smooth Shade All. This should show that all of your cubes are now black. Make six more shaders the same way you made the black one. Make them Red, Yellow, Blue, White, Orange, and Green. Zoom in on one of the cubes by selecting it and pressing "F" to "frame" it in the view. 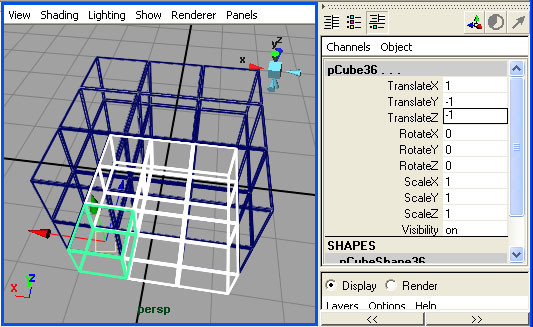 Select one of its lage faces by right click-and-holding on the cube, and selecting "Face" from the popup menu. When you are in face-selection mode, click on the center of one of the large faces. Assign one of the shaders to this face by right click-and-holding on one of the colored shaders in the Hypershade, and selecting Assign Material to Selection from the pop-up menu. Press "F8" to return to object selction mode. To assign shaders faster, you can assign them in groups all at once. 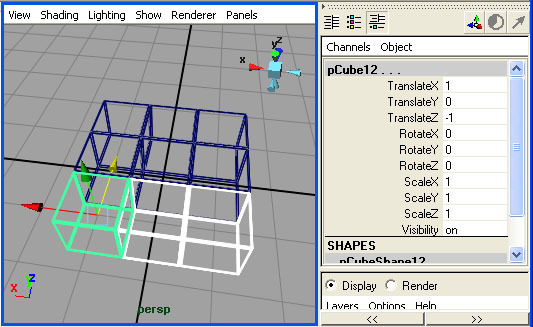 Select all of the cubes on one side of the large "cube". Press "F11" to switch to Face selecting mode. 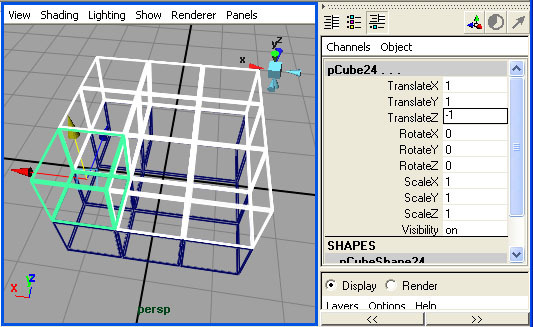 One-by-one, click on the large faces of each of the cubes. Assign a single shader to all of these faces by right-click-and-holding on a shader in the Hypershade, and selecting Assign Material to Selection from the pop-up menu. 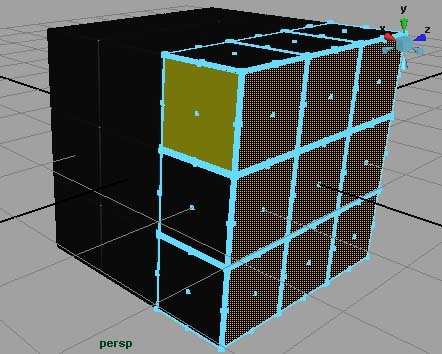 By repeating this process, you will eventually assign shaders to all of the large faces on the whole cube.